Mezzanine flooring offers a range of benefits for commercial business owners, from providing attractive extra storage space to offering a cost-effective alternative to relocating. 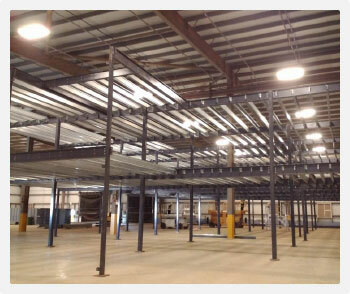 In some cases, mezzanine flooring can almost double the available floor space of your premises or office. Stodec Products are one of the leading designers, suppliers and installers of mezzanine flooring across the country, calling on over 30 years of experience in the industry to provide the highest quality service. Following a free site survey, we design a mezzanine solution perfectly tailored to the needs of your premises, working hard to ensure that it fits in with your existing layout and style. Installation is quick and onsite, carefully adhering to building regulations, with large spans of up to 9.5m between columns (up to 4.5m of clear headroom) available. Stodec’s mezzanine floors are freestanding, requiring no structural support from the existing building, and we provide all stairways, handrails, pallet gates, decking, joists and other related items in a range of colours and finishes. As part of a major warehouse equipment project, which Stodec Trading were installing for an international client in Africa, the company was required to design and supply a large two tier mezzanine floor. Visit our downloads section for more information on our services.